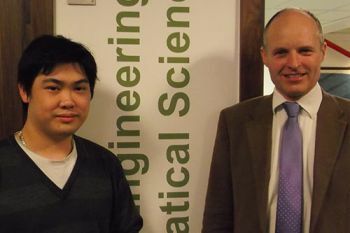 Two City MEng students take top prizes in the Institute of Mechanical Engineers (IMechE) Speak Out For Engineering Grand Final. Final year MEng (Mechanical Engineering) students Simon Wong and Resham Advani were first prize and runner-up winners, respectively, in the Institute of Mechanical Engineers (IMechE) Speak Out for Engineering London Grand Final which took place on 27th November. The pair faced stiff competition from a formidable field of fellow engineering students drawn from institutions across the UK, including Imperial College London, University College London and Queen Mary University London. The Speak Out For Engineering competition is specifically concerned with verbal and visual communication in explaining technical subjects and is designed to promote an interest in the art of communication. Simon and Resham addressed the development of flywheel energy storage for Formula Student Hybrid Cars and a buoyancy engine for converting waste hot water to electrical power. "I am very pleased with the way Simon and Resham researched, prepared and executed their speaking performances at the IMechE Speak Out for Engineering Competition. Simon is already doing excellent work in his mechanical engineering studies and is working on the dynamic finite element simulation of bursting flywheels. Resham spoke about a new engine concept that can potentially convert low-grade heat, as low as 70 degrees Celsius to mechanical power to generate electricity." "I was shocked and delighted to learn that I had won. It shows what can be achieved with hard work. The competition was pretty fierce and knowing that Resham and I were successful against other engineering students and professional engineers made the win even more special." "I was awestruck at winning such a prestigious award, especially given that participants were professionals in their field and students from places such as Kingston University and Imperial College London. I am happy that my lecturers nominated me for this challenge and that I was chosen as one of four finalists from 20 contestants. Winning the runner-up spot has given me the confidence to exceed limitations and be even prouder of City." In related news, Simon Wong's project, Containment Analysis of Flywheel Energy Storage, was this year's runner-up winner for the yearly British Gear Association/Institute of Mechanical Engineers (BGA/IMechE) Project Prize.